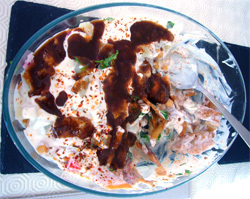 This is a lovely refreshing chaat that binds unusual ingredients together with yoghurt and tamarind. Place the spiced yoghurt in a wide serving dish. Add a generous porition of fried tortilla strips. Sprinkle the chick peas, potatoes and onions onto the yoghurt. Sprinkle the green chutney on top of the mixture, add more fried strips. Now add generous helping of tamarind sauce. Sprinkle chaat masala and fresh coriander.